There are several words used to describe the how humans copy things in the natural world for our own use. I use biomimetics, others use biomimicry, and today I learned a new one: bioinspiration. Has a nice sound to it, don't you think? Today, we take a lesson from Bicycle Repairman. I was getting a mite playful for a moment. This is about Wright brothers, who had several interests, including bicycles. They were firm creationary Christians, and wanted to know how to fly. The Wrights were right in studying birds, and they were very meticulous and scientific in their studies of how the Master Engineer created flight. They also looked at the failures of their contemporaries. Ever see old videos of "early flight attempts" or "flight failures"? Some were just weird, and many seemed to think that flight is a matter of flapping up and down, sometimes with paddles of other wing imitations. Studies show that wings have a far more intricate motion than we can see with the naked eye, but the brothers were able to analyze bird wings thoroughly enough so they could get their idea off the ground. First, gliders. Then they got going with powered flight. Not for long, at first, but they kept at it, as well as scientists and technicians that followed. Bill Nye the Propaganda Guy and others of his ilk insist that evolution is necessary for science to progress. This science of flight had nothing to do with evolution, so that twaddle has been refuted yet again. He should find this troubling. To read the rest, fly on over to "Bioinspiration: The Birds Will Tell You". EDIT: A reader of The Question Evolution Project on Fazebook supplied a link to another article that gives some additional information on the bros. Wright. 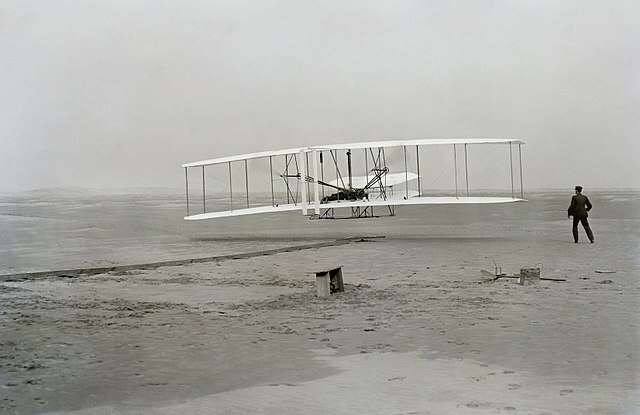 To read that, click on "The Wright Brothers — Pioneers of the Skies".